Remember when a gallon of regular grade gas was only $1? When filling up your car only cost you $15? Those were the days. Unfortunately, those are now the days long gone and likely never to return. With gas prices well into the $3 per gallon range just getting to and from work can be a financial burden. Everyone is looking to save a little bit of money on gas if they can. But how? 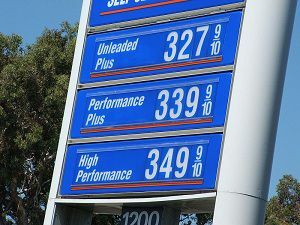 Here are tips to help you save on fuel costs whether it is cutting back on driving or increasing your miles per gallon. Depending on where you live and who in the family works, you may need two cars, only one, or none at all. If you live in a big city with decent public transportation, going without a car might be your best bet (and rent a car or use ZipCar when needed). Technically, using public transportation isn’t going to increase the MPG in your car. But if you’re really looking to save on fuel costs then using public transportation is absolutely the best way to go. Better yet, ditching your car will also save you money on car insurance and maintenance. Moreover, if you have two drivers but only one person needs to commute, having only one car might be inconvenient but workable. Another good alternative to public transportation is to arrange an office car pool, or use ride sharing services like eRideShare to find your ride. I am not suggesting that you go and replace your car. But if you are in the process of buying one, then use the opportunity to buy the right car for you and your family. A typical family of four does not really need two large vehicles (e.g., SUV or minivan). A good option is to have a smaller, more fuel efficient car for the person with the longest commute. I am still not sold on hybrid and electric cars. You might save more on gas, but I don’t think the savings make up for the higher price you pay for the car. Cars require regular maintenance to keep them in top performance. Top performance might make you think of horsepower and drag racing, but keeping your car in good running shape should keep your miles per gallon where they belong. Make sure to regularly change your air filter because your engine combines air, fuel, and spark to run. Not clogging up the air filter helps out a little bit on mileage. Likewise make sure you change your oil regularly using the recommended oil and at the recommended intervals. One thing you may not have thought of: make sure your gas cap keeps your gas tank sealed properly. An old, broken seal can vent gas ever so slowly past the cap which is literally like having your money evaporate. Another simple concept: the less weight your car has to push around with the motor (and thus gasoline) the higher your MPG will be. Don’t make a habit of keeping stuff strewn about your car and trunk. Some estimate that carrying an extra 100 pounds in your car can impact your fuel economy by 2%. Decluttering your car, getting the stuff out of the trunk, and even considering losing some pounds on your waist can help squeeze a few extra miles out of each gallon. Some people with removable seats even go as far as removing them from the car when they are not in use. Personally, I don’t think that is practical and don’t do it myself. If you have a vehicle that can carry a roof rack carrier make sure to store it away when you don’t need it. Going on family vacation and need to pack for 7 days for 2 adults and 3 kids? Grab the roof rack carrier for sure. But when you’re driving around town, store the carrier in your garage. It might be inconvenient and take up a lot of space, but having stuff on top of your car increases drag which requires more energy — that’s gasoline — to move the car around. If you don’t use roof rack, or seldomly have the need for it, a better option is not to install it in the first place. Some people over-inflate their tires to get the maximum MPG. I do not recommend this because I do not think it is safe. This will also wears out your tires and suspension system faster because the suspension system has to compensate for stiffer tires. If your tires are due for replacement, you can look for LRR tires (some manufactures call them Green tires or Eco tires). I recently replaced my worn out tires with a set of Bridgestone Ecopia EP422 LRR tires and my gas mileage improved about 10%. The savings won’t pay for the tires, but if you need them replaced anyway, why not go for the ones that can save you money. Did you know for most cars the optimal speed for fuel economy is 55 miles per hour? By driving 65 miles per hour in a 55 mph zone, you’re not only breaking the law and risking a ticket, but you’re burning more fuel than you need to. This tip involves several small ideas that you can combine to get big result. When you accelerate your car, be gentle with the accelerator. For most cars, this mean keeping your RPM below 3,000. Try to anticipate the traffic and coast your car when possible. When stopping, be gentle on the brake. In order to be able to do this, you will have to anticipate the traffic change and let your car decelerate. Most cars now come with cruise control as a standard option. For the most part, cruise control can do a better job of saving gas than you can, so use it as often as possible. The only function that I personally do not use is “resume” because I think it is better to use “set” then slowly accelerate the car; otherwise the cruise control will try to punch it to get back up to speed. Modern cars do not need to be warmed up for an extended period of time. Personally, I just start and go (even when it is cold out). Similarly, don’t keep your car running while you run your errands. Remember that while you idle, your car is getting 0 MPG (zero). If you have the option to walk or bike instead of drive, they are both healthier options for you and will save you money on gas. If you have the option to choose two different routes, e.g., a local route with stop-and-go traffic versus a highway, you can potentially save money on the highway even if it is longer distance. Another one is choosing between a relatively flat route versus a hilly one, a flat route will be better for your gas mileage. If you can avoid traveling during rush hours, or during big holiday weekends, you will save money on gas. Modern GPS with live traffic data are very affordable nowadays, they can help you avoid traffic congestion, saving you both time and money. I am a Costco member and one of the benefits is paying less at the pump. If I plan it right, I can go to Costco to do my shopping and get gas at the same time. This will save me about 10% off the regular price. Combine this with my TrueEarnings American Express Card and the savings go up to 13% (from the 3% cash back on gasoline). Saving 10% when you pay for gas is just as good as trying to improve your gas mileage by 10% (actually it is about 11%). Use the lowest octane gasoline (typically 87) unless your car specifically requires higher octane gasoline, or your can has a real issue with running on 87 octane. Again, the price difference between 87 octane and the next octane level is about 5%, so this alone can save you a few bucks each month. Great titbits! I did not know the cruise control would save you in gas. Gas always has a way to come back and bite you when you least expect it. How you drive has a huge impact on mileage. I tease my wife because when she drives my car, she tanks my mileage. 😛 The car is rated at 21mpg in the city, and that is right around what she gets. When I drive, I can push it to 25-26mpg. which may not seem like much, but it’s almost a 25% improvement! These are all great tips, and ones that I try to practice as much as possible. With how high gas prices are, I try to only take my car out when it’s necessary. Unfortunately I do need one for work. Great tips! I was remembering how back in the day we used to pay .99 for a gallon. Man, where has the time (and our money) gone? Good list. Carrying extra weight is a major problem. I try and go through the boot of my car each month and take out anything no essential. Yep PSI is critical as low tyre pressures means that the car has to work harder, which uses more gas. Check to see if you employers offer discounted public transit tickets. Great tips! In our case, we do not use the car if we can walk the distance, such as the 15-minute walk to and from the kids’ school and my cousin’s house located two blocks away. I finally sold my car and am taking public transportation now. Gas is just too much now, I can’t afford it.